Who are these people exactly that are going to go to war? are PSF led by Michelle O’Neill and the PIRA going to do it? Is the PIRA going to turn their coat once more and come back into existence to lead a new border campaign? 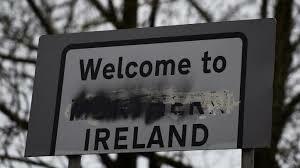 Are “dissidents” going to see their ranks swell to the max, magically get a load of money, weapons, training and resources and go to town on the border posts, is there a new generation of would be revolutionaries waiting in the wings for such an event to happen, ready at a moment’s notice to wage war on the Brits Brexit border ? I think the answer to all of the above is a resounding no. This is just reality, and let’s face it, the ordinary Irish person has been neutered entirely, they are powerless to stand up for themselves and stand against the things they oppose, they have by and large bought into a political process led by former Republican icons, they enjoy their new peaceful slavery and willingly go out in their droves to vote for people to administer British rule. They don’t mind an awful lot about the continuing British occupation, their primary concern is getting more and better rations from the master. 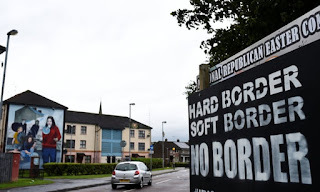 What these Journalists and politicians neglect to understand is that Republicanism will not change with a hard border, the British presence will not become any more or less tolerable to actual Republicans with a hard border or not. 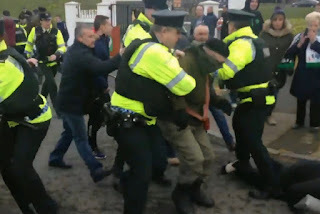 People may be enraged at disruption to their daily lives crossing the border, delays etc but enraged enough to go Michael Douglas falling down? I don’t think so. Journalists in Britain love writing about the prospect of “violence” in the North of Ireland, the idea of it is great, they are however completely ignoring that since the GFA which they herald as a wondrous peace process, the war did not stop for everyone. There is an armed campaign in Ireland at present albeit a very small one with only sporadic operations, there are numerous actual attacks on the British every year. the groups engaged in armed actions do not need a hard border to gain targets, there are hundreds of targets existing today as it is. I do not believe that people today who support the GFA will suddenly become die hard Republicans with the addition of a hard border and start joining “dissident” organisations. I think most of us living the reality here in Ireland also understand that at present there is no overall appetite at all for armed struggle, hard border or not. Now I can hear in my head a few people who will read this blog calling me all sorts, the people who live in fantasy Island and believe that there is some kind of real war being waged at present, guess what there isn’t, face facts. People also need to understand that there is a British Border that exists in Ireland TODAY! 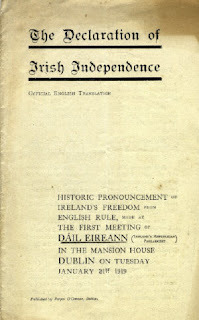 It may not be as visible but it is there none the less, the partition of this country and the ongoing British occupation in Ireland is the fundamental problem. If you are really concerned about a new armed campaign you need to address the real and legitimate reasons that exist for armed action, which is the British Presence at all in Ireland and not just one physical manifestation of occupation such as a hard border. Until then I lie quaking at the prospect of Ireland being blown to smithereens by raging Republicans who have awoken from a slumber because of a few customs men on the border! As I said before, there is no point professing to fight a war, when you're relevance is based on the fact that you have more prisoners in Gaol than anyone else. It is morally wrong. Armed struggle is a tactic, not a principal that has to be followed when you are not in a position to do so. Paddy sorry about late response on this, absolutely agree with you.